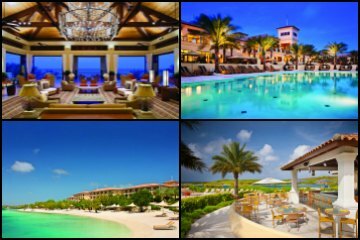 Here are the best Curacao resorts and hotels without meal plan: Marriott Beach Resort, Santa Barbara Beach & Golf, Hilton, Avila Beach Hotel, Lions Dive & Beach, Floris Suite Hotel, The Royal Sea Aquarium, Van der Valk Kontiki, Baoase Luxury Resort, Scuba Lodge & Suites, Blue Bay Golf & Beach, Kura Hulanda Lodge. Note that most of Curacao hotels either offer a breakfast option, or no meal plan. 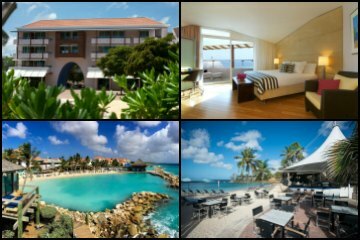 Curacao Marriott Beach Resort and Emerald Casino is an ideal luxury Curacao resort for singles, couples and families. Located near Piscadera Bay on the western coastline of the island, this Curacao resort is situated on six acres of oceanfront property. The beach at this low rise complex is superb for swimming with plenty of palm trees, thatched roof cabanas and white sand. The property has several levels of rooms based on limited, garden, ocean and beachfront views. There are a small number of one-bedroom oceanfront suites that feature a balcony and terrace. There are plenty of activities at the beach with an onsite vendor that rents snorkels, kayaks and standup paddleboards as well as scuba diving equipment. The resort has a wide variety of cuisine options with six restaurants onsite serving ala carte menus for breakfast, lunch and dinner. Portfino serves innovative Italian dishes in the evening. There is one freshwater swimming pool with a swim-up bar and nice garden area. Onsite there is the Emerald Casino, a fitness center and spa for guests to enjoy. The resort has complimentary shuttle service to Willemstad twice daily for patrons to explore the history and culture of the nearby city. This resort has a children’s club for children 4 through 12 years of age. Rooms: This luxury Curacao resort has 237 rooms and 10 suites. Rooms are all similar in size at 350 square feet and feature a private balcony or patio with limited, garden, Caribbean Sea and beachfront views available. One-bedroom oceanfront suites are spacious at 805 square feet with a private balcony and terrace for additional space. Presidential suites are situated on the top floor and are similar to the one-bedroom suite with a smaller private balcony. Restaurants: The Marriott Beach Curacao resort has six restaurants serving a variety of international cuisine. The Voila Coffee House serves light snacks from morning through the night; Palm Café can satisfy your morning hunger; The Boardroom Beach Bar unique bar swing and a nice lunch menu; Seabreeze Restaurant and Swim-Up Bar has just the right mixture of food and drink for lunch; Emerald Lounge offers handmade pizza and signature island cocktails in the evening; Portofino serves excellent Italian cuisine with ala carte menu service. Other dining options within a short distance to this resort are Sjalotte which features French, International and Mediterranean cuisine as well as El Gauho Piscadera which is an Argentine-style steakhouse. Beach: This Curacao resort has a large stretch of beach that has nice soft sand, palm trees and thatched roof cabanas. Beach Activities: Beach activities at this resort include soccer, volleyball and fitness classes. The complex does not offer complimentary watersport equipment but there is a dive center onsite that has sufficient rental items like kayaks, standup paddleboards and snorkels. The Caribbean Sea is calm at this beach and makes swimming a good activity. Entertainment: The resort offers live music several nights a week at one of the four bars and lounges onsite. Other entertainment and nightlife options exist a short distance away in Willemstad and the Pirate Beach Bar and Restaurant has live music as well as a fresh menu of Caribbean-style cuisine. Kids Activities: There is daily organized activities for children 4 to 12 years of age that include such items as nature walks, sand castle building, arts and crafts. Attractions: The Marriott Beach Curacao resort has Fitness Center, Dive Shop and Spa onsite; Scuba Diving; Motorized and Non-motorized Watersports; Fort Amsterdam; Kura Hulanda Museum; Riffort Village; Queen Juliana Bridge; Christoffel National Park; Ostrich Farm; Hato Cave; Blue Bay Golf Course; Dolphin Academy; Old Quarry Golf Course; Curacao Sea Aquarium. Pools: There is one freshwater swimming pool that is complete with a beautiful garden area, deck and a swim-up bar. There is also a sauna and whirlpool onsite. Santa Barbara Beach and Golf Resort is a couples and family-friendly Curacao resort located on the southwestern tip of the coastline near the town of Newport. There is a 2,000 acre nature preserve that surrounds the complex and provides additional recreational opportunities like hiking as well as bicycling. The beach area is white sand with space for umbrellas and loungers to relax. This low rise complex offers a variety of accommodation choices that range from spacious rooms to larger suites that range in size from 800 to 1,400 square feet of two-story living space. Upgraded amenities like butler service and suites with private freshwater plunge or swimming pools are available. The beach can be crowded at times and there is onsite rental for motorized and non-motorized watersport equipment. The complex has three freshwater swimming pools and a fountain area for children. Dining options include breakfast, lunch and dinner with buffet-style service at Medi as well as the Shore Restaurant for a great fine dining experience in the evening. The property has many entertainment features that include live music, themed dinners and even a nightly sushi bar in the lobby. The resort has tennis courts, an 18-hole golf course, dive center, fitness center and spa onsite. The complex has complimentary shuttle service to Willemstad during the day. Children ages 3 to 12 years of age can attend the Arawak Camp which offers organized activities throughout the day. 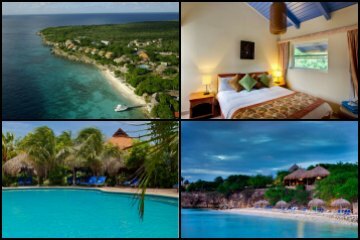 Rooms: Santa Barbara Beach and Golf Curacao resort of low rise buildings has 350 rooms and suites. Rooms are spacious with private balconies and offer views of the resort and ocean. There are four styles of suites available that range from the 800 square feet Santa Barbara and Tula suites to a slightly larger Sunset suite. All of these suites have one-bedroom, spate living area, private balconies or patios as well as spacious living interiors. The Royal suite has two-bedrooms and is 1,400 square feet of luxury as well as a two-story floorplan. Sea Tradition rooms and suites have upgraded amenities, private freshwater swimming pool as well as on-call butler service. Suites and Sea Tradition accommodations have a variety of views from golf course, ocean, resort to island landscape. Restaurants: Santa Barbara Beach and Golf Curacao resort has several restaurants that will satisfy guests with cuisine from around the world. Splash is the perfect beach and poolside experience with signature dishes as well as island cocktails; Medi Restaurant has buffet-style and ala carte menu service for breakfast, lunch and dinner with themed dinners in the evening; Jun’s Sushi Bar features fresh seafood with a Japanese twist; The Shore Restaurant has unique and culinary delights from the Caribbean with ala carte menu service in the evening. Other dining options nearby include Bella Italia and Boca 19 is situated near the Old Quarry Golf Course and Barbara Beach Marina. Beach: The Santa Barbara Beach is partially man-made and is composed of beautiful white sand. There is plenty of space to lounge and there are cabanas for guests. Beach Activities: The beach is great for fitness and yoga classes. Motorized and non-motorized watersport equipment is available onsite but is not complimentary. The water is calm at this location and is good for swimming within the protected lagoon. Entertainment: Santa Barbara Beach and Golf Curacao resort has the Old Quarry Golf Course, fitness center, tennis courts and full service spa onsite for guests to enjoy. There is plenty of nightlife on this property that includes themed nights, live music and dancing shows. The property has a complimentary shuttle to and from Willemstad during the day for guests. Kids Activities: Camp Arawak is available for children 3 to 12 years of age. Organized activities include snorkeling, nature walks as well as arts and crafts projects. There is also babysitting services available for an additional fee. Attractions: Fitness Center, Old Quarry Golf Course, Tennis Courts, Dive Shop and Spa onsite; Scuba Diving; Motorized and Non-motorized Watersports; Fort Amsterdam; Kura Hulanda Museum; Riffort Village; Queen Juliana Bridge; Christoffel National Park; Ostrich Farm; Hato Cave; Blue Bay Golf Course; Dolphin Academy; Curacao Sea Aquarium. Pools: Santa Barbara Beach and Golf Curacao resort has three freshwater swimming pools for guests. The two main pools have wonderful decks with cabanas and plenty of luscious gardens. Splash provides poolside services like food and drink. The third pool is reserved for guests that are staying in the Sea Tradition rooms and suites. The Hilton Curacao is a family-friendly high rise Curacao resort that is surrounded by 23 acres of landscaped gardens. Situated at the mouth of Piscadera Bay, this Curacao resort is located on the southwestern shoreline of the island near the town of Willemstad. The property has two private white sand beaches with plenty of space for fun or lounging and the swimming is good at this location. The complex offers accommodations which have a view of the island or Caribbean Sea from a private balcony. Executive Club rooms and suites are located on the upper floors and offer upgrade amenities like complimentary breakfast as well as a happy hour party with appetizers. The beach activities range from fitness classes to volleyball and an Infinity freshwater swimming pool that is surrounded by a luscious garden area. Motorized and non-motorized watersport equipment is available for rent onsite. The complex has a variety of choices for dining with a buffet-style breakfast at the Aqua Restaurant and ala carte Italian dishes at Cielo in the evening. The Celeste Beach Bar features beach and poolside service for lunch in a relaxed setting. The resort offers live music on selected nights of the week and the onsite casino, fitness center, tennis court as well as spa will keep you entertained. There are other nightlife and dining options nearby in Willemstad. There resort has a nice playground and recreational game center for children as well as a separate children’s freshwater splash pool. The complex offers a Kids Club for children 4 to 12 years of age and babysitting services can be arranged for an additional fee. Rooms: This high rise Hilton Curacao resort has two styles of rooms which vary from 269 to 377 square feet. Each room has a private balcony with a view of the island or Caribbean Sea. Executive Club rooms are located on the upper floors and include an island or ocean view from a private balcony. Executive suites are available on upper floors with more living space and a bigger view of the island or ocean from the private balcony. Junior suites are slightly larger with views of the Caribbean Sea. Executive Club rooms and suites have upgraded amenities including access to the Executive Club for complimentary breakfast and happy hour with island cocktails as well as hot appetizers. Restaurants: Hilton Curacao resort has three restaurants onsite featuring a variety of international and local cuisine. The Aqua Restaurant has a great buffet-style breakfast; Cielo has innovative and fresh Italian dishes; Celeste Beach Bar offers beach and poolside service during lunch as well as transforming into a steak house on selected nights of the week for dinner; Captain Bligh’s Bar is ideal for that tropical island libation and the Corner Shop has quick snacks. There is an Executive Club that serves complimentary breakfast and afternoon cocktails as well as appetizers for upgraded guests. Beach: This complex has two private beaches that feature nice white sand. There are umbrellas, palapas and palm trees for shape. Beach Activities: There are plenty of activities like volleyball, soccer, fitness classes and dance lessons on the beach. Motorized and non-motorized watersport equipment is available onsite for an additional fee. The swimming in the protected area is quite nice. 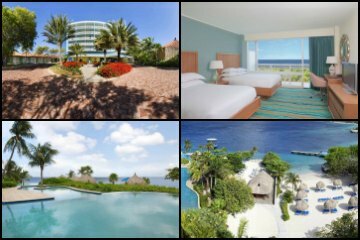 Entertainment: Hilton Curacao resort has a casino, dive center, fitness center, basketball and tennis court onsite for guests. There is live music on selected days and nights at Celeste Beach Bar and Captain Bligh’s Bar. The complex offers free shuttle service to Willemstad. Kids Activities: This complex has a kids club for children 4 to 12 years of age with organized activities like games, team sports as well as sand castle building. There is a separate children’s pool and a nice playground. This resort can also arrange babysitting services for an extra fee. Attractions: Casino, Fitness Center, Dive Shop, Tennis Court and Spa onsite; Scuba Diving; Motorized and Non-motorized Watersports; Willemstad; Kura Hulanda Museum; Riffort Village; Queen Juliana Bridge; Christoffel National Park; Ostrich Farm; Hato Cave; Shete Boka National Park; Blue Bay Golf Course; Dolphin Academy; Old Quarry Golf Course; Curacao Sea Aquarium; Floating Market; Maritime Museum. Pools: There is one Infinity freshwater swimming pool at Hilton Curacao resort. The complex also has a separate children’s pool. The Avila Beach Hotel has been catering to couples for over sixty years and is the oldest continually operated Curacao resort on the island. Situated on southwestern coastline of the island near Willemstad, this property has two private beaches with a protected lagoon. The hotel has three distinct sections with the Blues wing which were renovated in 2014, Belle Alliance wing and Octagon Wing. Accommodations range from rooms with kitchenettes to apartment-style with a full kitchen. Each style of room has a private balcony with views of the Caribbean Sea, garden or Octagon Plaza. The property has one freshwater Infinity swimming pool that is surrounded by a luscious garden and sundeck overlooking the Caribbean Sea. Activities like motorized and non-motorized watersports are available from local vendors as well as fitness classes and yoga sessions from trained professionals from the resort. The resort has several options for dining that include a buffet-style breakfast, lunch service at the Pool Bar as well as ala carte menu of international delights at the Blues Restaurant. The property has some nightlife options with live music and themed barbeque buffets on selected nights. There is a free shuttle service that operates twice daily to Willemstad where guests will find shopping, dining options and nightlife activities. The complex has a small boutique, fitness center, tennis courts and a full service spa onsite for patrons. Children are welcomed at this property although there is not an organized kids club. Babysitting service can be arranged through the resort. 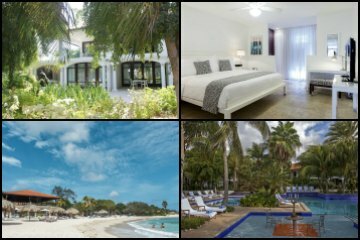 Rooms: Avila Beach Curacao resort is situated in an 18th century mansion which has been renovated as well as enlarged to accommodate 150 rooms and suites. The modern European décor has subtle plaid accents throughout. There are three different sections to this property that include the La Belle Alliance Wing, Octagon Wing and Blues Wing. There are 40 La Belle Alliance rooms in this Dutch Caribbean influenced section which offer a private balcony and stunning views of the garden. Rooms with king beds are furnished with a small kitchenette. One and two-bedroom apartment-style accommodations which sport a full kitchen, large terrace and spacious living area are available within this wing. The Blues Wing was renovated in 2014 and is constructed on pier off one of the private beaches. Each room has a small kitchenette and incredible views of the Caribbean Sea as well as the coastline from a large terrace or balcony. The Octagon Wing has 68 rooms in two categories that feature partial-ocean, garden and Octagon Plaza views from a private balcony. The Simon Bolivar Suite is located on the top floor of the Octagon Wing and has a wrap-around terrace with big views of the Caribbean Sea as well as a small kitchenette. Restaurants: Avila Café at Avila Beach Curacao resort boasts a buffet-style breakfast daily; Blues Bar and Restaurant boasts innovative Caribbean as well as fresh seafood from an ala carte menu for dinner; Bella Terrace Restaurant features a nice all-day lunch menu as well as a fresh international approach for dinner with ala carte menu service; the Executive Voyager Lounge serves cocktails from a silver tray and guests must be invited to enjoy this upgraded service; Café Barista serves all your favorite coffee drinks, salads and sandwiches. There is a dinner on the beach option which includes a candlelight three-course meal by the pool or beach with fantastic views of the Caribbean Sea while you dine. The Pool Bar has a nice lunch menu with island cocktails all day; the Schooner Bar serves up an eclectic menu of cuisine from morning through the night and hosts a raucous happy hour every day. Beach: Avila Beach Curacao resort has two small beaches which offer plenty of space to lounge and relax under an umbrella or palm tree. The East Beach or Queen Beach is windy at times. The West Beach has a small protected lagoon. Beach Activities: The two small beaches offer relaxation and motorized and non-motorized watersports. Equipment rental is available through local vendors. The protected lagoon is perfect for swimming. Entertainment: This property has a fitness center, tennis courts and Santai Spa onsite. The resort hosts live music and themed barbeque as well as buffets on several nights of the week. Other nightlife and entertainment options exist in nearby Willemstad which is a short taxi ride. Kids Activities: There is not a formal kids club associated with this property. Attractions: Avila Beach Curacao resort offers Fitness Center, Dive Shop, Shopping, Tennis Courts, Octagon Museum and Santai Spa onsite; Scuba Diving; Motorized and Non-motorized Watersports; Willemstad; Kura Hulanda Museum; Riffort Village; Queen Juliana Bridge; Christoffel National Park; Ostrich Farm; Hato Cave; Shete Boka National Park; Blue Bay Golf Course; Dolphin Academy; Old Quarry Golf Course; Curacao Sea Aquarium; Floating Market; Maritime Museum. Pools: This complex has one freshwater Infinity swimming pool which is surrounded by a nice deck and beautiful garden. Lions Dive and Beach Curacao Resort is a family-friendly low rise property situated on the southwestern coastline of the island near the Sea Aquarium, Mambo Beach and Willemstad. The private beach area here is nice and made of white sand with plenty of space for lounging. Accommodations at this Curacao resort range from basic rooms to apartment-style suites with full kitchens. Suites are available in both one and two-bedroom layouts with each having two bathrooms and private balconies. One-bedroom suites have a larger living area which has a Murphy bed for guests. Beach activities are run through the onsite dive shop where guests can rent equipment for motorized and non-motorized watersports. The complex has several restaurants onsite including Hemingway Beach Bar as well as Chill Bar and Grill which are located beachside. Cuisine ranges from buffet-style breakfast to fresh seafood from an ala carte menu. The property has live music and themed barbeque night on the beach on selected evening. More dining and nightlife options exist in nearby Willemstad or along Mambo Beach. The resort has two freshwater swimming pools including a massive 50 meter lap pool for guests and a small Infinity pool which overlooks the Caribbean Sea. There is a fitness center, dive shop and full service spa onsite for guests. The complex does not have a formalized kids club but offers such activities as swimming lesson through the SwimFactory and there is a shallow pool for children. Rooms: The low rise Lions Dive and Beach Curacao Resort has 132 rooms and apartment-style suites. Rooms are classified by the view seen from the private balcony or terrace such as garden, pool, street, ocean and oceanfront. The resort has 24 luxury two-bedroom apartment-style suites that were constructed in 2008 are furnished with a view of the pool area from the private balcony as well as a full kitchen. There are 10 luxury suites that are one and two-bedroom units. Each is similar in size with one-bedrooms offering a Murphy bed in the expansive living area. Suites have a full kitchen, two bathrooms and a private balcony with ocean views. Restaurants: Lions Dive and Beach Curacao Resort has three restaurants serving eclectic cuisine on the beach and near the pool area. Hemingway Beach Bar has a perfect buffet-style breakfast and ala carte menu service for lunch as well as dinner; Chill Beach Bar and Grill has several grilled items for lunch and dinner; Piazza is situated next to the pool with a Mediterranean-style menu; patrons can enjoy the freshest of island cuisine at Nemo Seafood Restaurant for dinner. Other dining options exist nearby where the Bigeye Scad is perfect for fried fish specialties of the region or the Seaside Terrace for exquisite Caribbean-style seafood cuisine. Beach: Lions Dive and Beach Curacao Resort has a private beach which has soft white sand and space for umbrellas. There are also a number of palm trees and lush gardens surrounding the beach area. Beach Activities: Beach activities at this complex include volleyball, fitness classes and yoga sessions. There is a dive shop onsite where guests can rent all types of motorized and non-motorized watersport equipment. The beach area at this location is good for swimming. Entertainment: Lions Dive and Beach Curacao Resort has a nice fitness center, dive shop and full service spa onsite for guests. The resort hosts several fitness classes and yoga sessions on the beach as well as the pool area. There is live music at Hemigway Beach Bar on selected nights of the week. Other nightlife options within a short distance of the hotel are Bermuda Curacao for club-style dancing and the 27 Bar and Terrace for live island music. Kids Activities: There is not a kids club on this property. The SwimFactory holds specialized water classes at various times each day for children. There is also a shallow pool for children. Attractions: Fitness Center, Dive Shop and Spa onsite; Scuba Diving; Motorized and Non-motorized Watersports; Willemstad; Kura Hulanda Museum; Riffort Village; Queen Juliana Bridge; Christoffel National Park; Ostrich Farm; Hato Cave; Shete Boka National Park; Blue Bay Golf Course; Dolphin Academy; Old Quarry Golf Course; Curacao Sea Aquarium; Floating Market; Maritime Museum. Pools: Lions Dive and Beach Curacao Resort has two freshwater swimming pool which includes a 50 meter lap pool that is ideal for serious laps or a quick plunge. The other pool is smaller and overlooks the ocean. The property has one shallow pool for children. Floris Suite Hotel spa and Beach Club is a chic adults-only as well as a LGBT-friendly Curacao resort which is situated on the southwestern portion of the island just northwest of Willemstad. This property is not located on the beach and is within a short five-minute walk to Parasasa Beach. The modern décor is sleek and mostly white with some black accents in this all-suite hotel. Suites range from junior size which has extra area in the living room and a private balcony with views of the garden or pool. One-bedroom Royal and Imperial suites have enlarged patios or balconies, a full kitchen or kitchenette and views of the garden or pool area. There are plenty of activities on the nearby beaches and guests will find motorized and non-motorized watersport equipment for rent at the Pirate Bay Beach Club. The property has a couple of dining options that include poolside service as well as an exquisite fine dining experience at Sjalotte which features local Caribbean cuisine. The complex has several bars including the Rainbow Lounge which is open for libations in a lively atmosphere. Other dining and nightlife options are just minutes away in Willemstad. There is a free shuttle that travels to Willemstad at various times each day. There is one freshwater swimming pool that has a beautiful garden, swim-up bar and plenty of space to lounge. The resort has a fitness center and full service spa onsite for guests. Rooms: This chic Curacao resort has 72 all-suite accommodations. The décor is primarily modern European décor with plenty of white walls with black highlights. Suites range from junior size with a nice private balcony and extra living space to a one-bedroom Royal suite that boasts even more space with a full kitchen and larger outdoor space to the Imperial suite which has a kitchenette and an expansive living area both inside as well as outside. All suites have a view of the garden or pool area. Restaurants: Guests have a few dining options at this resort. The Pool Bar is ideal for that poolside lunch of salad, sandwiches or fresh seafood. While on the Parasasa Beach patrons can indulge in food and drink at the Moomba Beach Club. In the evening there is fine ala carte dining at Sjalotte which features Caribbean seafood specialties. The Rainbow Lounge is the perfect spot for nightly fun with light food fare and plenty of specialty libations. Other dining options are just moments away at El Gaucho Piscadera and the Wine Cellar which is located in Willemstad. Beach: This Curacao resort is within a short five-minute walk to two separate beaches. Parasasa Beach is quieter and is shared with the Hilton and Marriot resorts. The second beach is more lively and is associated with the Pirate Bay Beach Club. Beach Activities: Patrons can relax at the Parasasa Beach under a nice cabana or you can swim in the Caribbean Sea. Guests who want more action and are interested in beach games or renting motorized and non-motorized watersport equipment should visit the Pirate Bay Beach Club. Entertainment: The complex contains a fitness center and full service spa. The resort offers a free shuttle during the day that travels to Willemstad. The Rainbow Lounge has a clubby atmosphere in the evening with small plates and signature island cocktails. Guests may take a short taxi ride into Willemstad or walk along the coastline for exciting nightlife options. Kids Activities: This is an adults-only Curacao resort. Attractions: Fitness Center and Spa onsite; Scuba Diving; Motorized and Non-motorized Watersports; Willemstad; Kura Hulanda Museum; Riffort Village; Queen Juliana Bridge; Christoffel National Park; Ostrich Farm; Hato Cave; Shete Boka National Park; Blue Bay Golf Course; Dolphin Academy; Old Quarry Golf Course; Curacao Sea Aquarium; Floating Market; Maritime Museum. Pools: Curacao resort has one freshwater swimming pool that is surrounded by a gorgeous garden setting and has a swim-up bar as well as poolside service from the Pool Bar. The Royal Sea Aquarium Curacao Resort is a family-friendly complex that is situated on a man-made island on the southwestern coastline of the island just minutes away for Willemstad. This Curacao resort is directly connected to the Curacao Sea Aquarium and Dolphin Academy which offer plenty of activities for individuals as well as families. The beach area at this property is small with plenty of natural shade from the tropical vegetation. Accommodations at this resort are all suite-style and villas. Junior suites have a nice living area with a private balcony. The one and two-bedroom suites have expanded living areas which include at least one Murphy bed, a full kitchen and a large outdoor space with views of the Caribbean Sea. There are plenty of activities on the beach from motorized and non-motorized watersports to dance lessons to volleyball games. Other exciting options at this complex include visiting the aquarium and swimming with dolphins as well as a variety of educational events. Augusto’s is the only restaurant onsite and serves fresh Italian cuisine. The resort hosts live music and karaoke on selected nights for entertainment. There are numerous dining and nightlife opportunities exist in nearby Willemstad or just by taking a quick walk up or down the coastline. The property has a free shuttle service that will take people to a local grocery store or Willemstad. The complex has two freshwater swimming pools and a separate children’s pool which are surrounded by nice tropical gardens. The resort has a Kids Club associated with the aquarium and academy which provide organized events for children throughout the day. 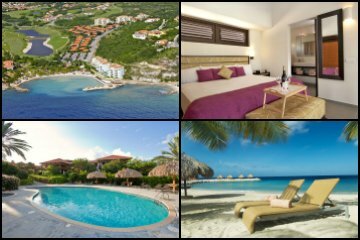 Rooms: This low rise cluster of buildings is an upper mid-range Curacao resort that has 60 suites and villas. Accommodations include a junior suite that has a kitchenette, private balcony with garden and ocean views. One-bedroom villas have a large living area, Murphy bed, full kitchen and an expanded patio or balcony with views of the garden, pool or ocean. Two-bedroom villas have two Murphy beds, two bathrooms, full kitchen, wet bar and two outdoor spaces with views of the Caribbean Sea. Some of the villas and suites also have various views of the animals located within the Sea Aquarium as well as the Dolphin Academy. Restaurants: There is one restaurant onsite and Augusto’s serves up fresh Italian cuisine with an island twist. The Madero Ocean Club is located on Mambo Beach with an upbeat atmosphere and Baoase Culinary Beach Restaurant serves tasty French, Caribbean and International cuisine. Plenty of other dining experiences are within a short walking distance or taxi ride to Willemstad. Beach: The beach area at The Royal Sea Aquarium Curacao Resort is small with white sand and plenty of tropical shade provided by palm trees. Beach Activities: The complex has limited complimentary non-watersport equipment for kayaking and snorkeling. There are dance lessons, leisure games and volleyball on the beach. The water is generally calm and swimming is good. Entertainment: The Royal Sea Aquarium Curacao Resort is connected to the Curacao Sea Aquarium and Dolphin Academy. This complex has a variety of scheduled organized activities for individuals and families. Augusto’s has live music and karaoke nights on selected evenings during the week. There is plenty of nightlife and entertainment close by at Mambo Beach which has a shopping and dining complex which is popular with tourist or guests may choose Hemingway Beach Bar which is within walking distance. The resort offers a complimentary shuttle service to a nearby grocery store as well as the town of Willemstad, where numerous dining and nightlife options are located. Kids Activities: The resort has an organized Kids Club onsite with the Curacao Sea Aquarium and Dolphin Academy next door. There is a separate children’s pool at this complex. Attractions: Sea Aquarium, Dolphin Academy and Dive Shop onsite; Scuba Diving; Motorized and Non-motorized Watersports; Willemstad; Kura Hulanda Museum; Riffort Village; Queen Juliana Bridge; Christoffel National Park; Ostrich Farm; Hato Cave; Shete Boka National Park; Blue Bay Golf Course; Old Quarry Golf Course; Floating Market; Maritime Museum. Pools: The Royal Sea Aquarium Curacao Resort has two freshwater swimming pools that have plenty of deck space and are surrounded by a nice garden area. The complex has a children’s pool as well as a large hot tub that can accommodate up to 20 guests. Van der Valk Kontiki Beach Curacao Resort is an upper mid-range which is on the chic side of trendy and is geared for younger adults as well as couples. Located on Mambo Beach which lies on the southwestern coastline of the island near Willemstad, this Curacao resort is not situated on the oceanfront and guests can access the beach within a short walking distance at the Cabana Beach Club which is connected to the property. This low rise complex contains 20 buildings that house four rooms each. There are five buildings that surround each of the four lagoon-style pools and each room has a private balcony or patio with a view of the pool as well as the manicured tropical gardens. The four lagoon-style swimming pools are a highlight of the property with their associated waterfalls. Guests can enjoy a variety of motorized and non-motorized watersport activities with rental equipment available at Cabana Beach Club. The Cabana Beach Club is the only restaurant onsite and is lively starting in the morning with buffet-style breakfast and continuing into the wee hour of the evening with live music as well as themed barbeque nights. There is a large outdoor playground for children but the complex does not offer an organized kids club. Rooms: Van der Valk Kontiki Beach Curacao Resort is a low rise complex, constructed of 20 buildings that house four rooms a piece. The interior décor of the rooms have bright colors as well as wood paneled walls and vaulted ceilings. Each complex of five buildings surrounds an individual lagoon-style freshwater swimming pool with fabulous gardens. Each room has a private balcony or patio with a view of the garden and pool area. Tropical Superior-full service rooms include a lounge bed at Cabana Beach Club and upgraded amenities. Restaurants: The Cabana Beach Club has a delightful buffet-style breakfast, an ala carte lunch menu with your favorite beach food and at night the club transforms into themed barbeque nights on the beach. There are several restaurants within walking distance that include Restaurant Seasons for French and International cuisine and Bigeye Scad which offers Caribbean-style cuisine fried fish dishes. 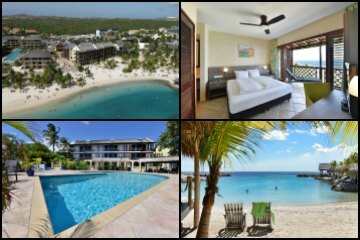 Beach: Van der Valk Kontiki Beach Curacao Resort is not located directly on the beach. Guests can access the tourist oriented Mambo Beach or use the Cabana Beach Club which is associated with the resort. Beach Activities: Guests can rent motorized and non-motorized watersport equipment at Cabana Beach Club or Mambo Beach. Various impromptu volleyball and soccer games form on the beach area. Swimming is good at this location. Entertainment: This property has several themed night barbeques, karaoke nights, live music and DJ’s nightly at Cabana Beach Club. Live music off-property is just seconds away at the Wet and Wild Beach Club and in Willemstad. Kids Activities: This complex does not have a formal kids club. There is a large outdoor playground onsite for children. Attractions: Van der Valk Kontiki Beach Curacao Resort has access to Scuba Diving; Motorized and Non-motorized Watersports; Willemstad; Kura Hulanda Museum; Riffort Village; Queen Juliana Bridge; Christoffel National Park; Ostrich Farm; Hato Cave; Shete Boka National Park; Blue Bay Golf Course; Dolphin Academy; Old Quarry Golf Course; Curacao Sea Aquarium; Floating Market; Maritime Museum. Pools: This property has four freshwater swimming pools that are lagoon style with plenty of nice seating and surrounding gardens. Baoase Luxury Curacao Resort is the quintessential property for couples that are looking for a luxurious and upper-range romantic Curacao resort. 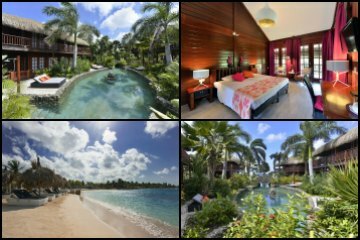 Situated along a large stretch of private beach, this Indonesian influenced boutique-style resort is located on the southwestern coastline just a short taxi ride from Willemstad. The luxurious accommodations at this complex are unique and 12 of the 23 rooms, suites and villas have a private freshwater Infinity swimming pool. There is even a house on a private island which can be rented with or without butler and chef service. The beach activities are minimal and motorized as well as non-motorized watersport equipment can be rented onsite. Daily activities on the resort include yoga and fitness classes. There is one freshwater Infinity swimming pool which is surrounded by beautifully manicured gardens. The Baoase Culinary Beach Restaurant is spectacular with ala carte menu for breakfast, lunch and dinner. Cuisine is innovative and there are four-course tasting menus featuring a mixture of world cuisine from French to Caribbean to Asian. The complex has a fitness center and full service spa onsite for guests to enjoy. Although this property tends to have younger romantic couples, children are welcome but there are no organized activities at this resort for children. Rooms: This Indonesia inspired boutique-style Baoase Luxury Curacao Resort is full of luxury. There are three room styles that range from the 431 square feet Banyan Tree room with an additional 80 square feet private patio with a garden view to the Loft room at almost 600 square feet with an additional 430 square feet of outdoor living space to the Colonial room with 584 square feet and a smaller patio space. Each of the three rooms can be adjoined. There are three one-bedroom Beachfront Pool suites with private infinity freshwater swimming pool and plenty of additional outdoor space for living. There are six larger Superior Beachfront Pool suites which are larger with more amenities and a private Infinity pool. The three styles of villas can range from one to three-bedrooms with an oceanfront view to a Private Pool villa with three to four-bedrooms and the Master Villa can be adjoined with one of the three rooms to make for a luxurious one-to four bedroom mansion. The private island of Isla Kiniw is luxury at its finest with four-bedrooms and four bathrooms. The villa has a full kitchen, private pool and beach as well as a plethora of amenities like watersport equipment. Butler, chef and maid service is available. Restaurants: Baoase Luxury Curacao Resort offers the Baoase Culinary Beach Restaurant which has an assortment of amazing menus for each meal. Located on the beach, breakfast is served ala carte with a variety of delights. Lunch features a four-course tasting menu, beachside favorites and wonderful small plates to share. Dinner time the restaurant has an eclectic four and five-course tasting menu as well as ala carte service that ranges from French to Caribbean fusion cuisine. Romantic gazebo dining for two on the beach with your own private chef is available. More dining opportunities are just moments away in Willemstad at such places as the Wine Cellar and the Seaside Terrace for fresh Caribbean seafood cuisine. Beach: The beach at this Baoase Luxury Curacao Resort has nice soft sand with plenty of palm trees and cabanas for shade. Beach Activities: Baoase Beach is quiet with private beach escapes that include a cabana and light snacks and water throughout the day. Yoga and fitness classes are offered at the beach. Motorized and non-motorized watersport equipment is available for rent by local vendors. The swimming at this location is good with calm waters. Entertainment: The resort has a fitness center and full service spa onsite. There is live music one evening a week and this property tends to be very quiet in the evening. Nightlife and entertainment options are available with a short taxi ride to Willemstad. Kids Activities: There are no organized children activities at this complex. Attractions: Private Island, Fitness Center and Spa onsite; Scuba Diving; Motorized and Non-motorized Watersports; Willemstad; Kura Hulanda Museum; Riffort Village; Queen Juliana Bridge; Christoffel National Park; Ostrich Farm; Hato Cave; Shete Boka National Park; Blue Bay Golf Course; Dolphin Academy; Old Quarry Golf Course; Curacao Sea Aquarium; Floating Market; Maritime Museum. Pools: Baoase Luxury Curacao Resort has one freshwater lagoon-style swimming pool that is surrounded by waterfalls and lush garden scenery. The area is peaceful with lots of space for privacy. Scuba Lodge and Ocean Suites is an ideal mid-range destination for scuba divers as well as people looking for a small boutique-style Curacao resort. The complex is situated along the southwestern coastline of the island and within walking distance to Willemstad. The resort is located along a rocky shoreline and does not offer much beach area for guests. This boutique property has character and resides in a 19th century building that has been renovated as well as having one newer addition with additional rooms. There are 22 rooms and apartment-style suites that have a nice view of the Caribbean Sea or tropical gardens from a private balcony. Superior Deluxe rooms have a small kitchenette. The two and three-bedroom suites are furnished with a nice full kitchen. All motorized and non-motorized watersport equipment is available for rent from the onsite dive center. Scuba divers are especially drawn to this property because of the dive center. There are two small freshwater Infinity swimming pools with one overlooking the Caribbean Sea. Each has a nice deck for lounging and the garden setting is perfect. The waterfront restaurant serves a variety of international and local cuisine with ala carte menu service. There is a weekly barbeque night that features traditional Caribbean-style dishes. There is no nightly entertainment scheduled at this property and guests are within walking distance to dining and nightlife options located in Willemstad. The property does not have a formal kids club for children. 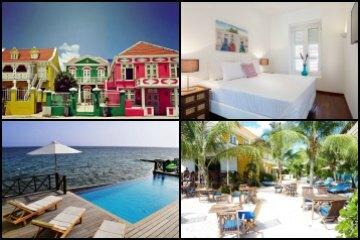 Rooms: Scuba Lodge & Suites Curacao resort t has 22 rooms which have been constructed between 2008 to 2015. Standard and Superior rooms have private terraces with garden views. Superior Deluxe rooms have a view of the Caribbean Sea from the private balcony and a small kitchenette. There are two and three-bedroom apartments with a full kitchen and a private balcony that has an ocean view. Restaurants: The restaurant onsite serves a great breakfast basket or enjoy an ala carte menu of items, lunch has perfect island salads and sandwiches as well as for dinner there is a nice three-course price fixed menu of international cuisine that is prepared to order. The restaurant hosts a beach barbeque night once a week. Other dining options within walking distance are Brasserie Chapter for eclectic French cuisine and Restaurant Fishalicious for all your seafood desires. 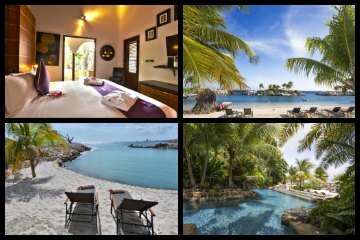 Beach: Scuba Lodge & Suites Curacao resort is located by a rocky shore and there is not much sand. Guests may take a bus or taxi to nearby Cabana and Mambo Beaches. Beach Activities: There are no beach activities located at this resort. Guests may travel to Mambo or Cabana Beach by bus or taxi. Motorized and non-motorized watersport equipment is available for rent onsite at the dive center. Entertainment: There is no scheduled entertainment at Scuba Lodge & Suites Curacao resort. Guests are within a short walking distance to superb nightlife and dining options in Willemstad. Patrons are close to such places like 27 Bar and Terrace for live music and Bermuda Curacao has a dance club atmosphere that rolls all night. Kids Activities: There is not a formal kids club located on this property. Attractions: Dive Shop onsite; Scuba Diving; Motorized and Non-motorized Watersports; Willemstad; Kura Hulanda Museum; Riffort Village; Queen Juliana Bridge; Christoffel National Park; Ostrich Farm; Hato Cave; Shete Boka National Park; Blue Bay Golf Course; Dolphin Academy; Old Quarry Golf Course; Curacao Sea Aquarium; Floating Market; Maritime Museum. Pools: Scuba Lodge & Suites Curacao resort has two freshwater swimming pools with one set in the garden and the other overlooking the Caribbean Sea. The Blue Bay Curacao Golf and Beach Curacao Resort is a luxury family-friendly complex which is situated at Blue Bay Beach on the northwestern coastline of the island just fifteen minutes north of Willemstad. Blue Bay Beach is one of the largest stretches of white sand on the island with plenty of vegetation of options for fun and relaxation. The property has four distinct areas of accommodations that feature a wide assortment of apartment-style suites and villas. Each area has a gorgeous view of the golf course, tropical gardens, pool or Caribbean Sea. One, two and three-bedrooms are available which are furnished with full kitchens, private terraces and some have a private freshwater plunge or swimming pool. The beach offers plenty of action from swimming to motorized and non-motorized watersports which are available for rent through the dive center. The resort boasts an 18-hole golf course that is situated along the coastline, fitness center and tennis courts. There is one freshwater swimming pool located in the Hills section of suites. The property has limited food and drink options with AzZuro open for breakfast, lunch and dinner as well as the Sunset Bar and Grill in the evening. There are dining and nightlife options within a short taxi ride from the complex. The resort offers a Kids Club for a small additional fee and the playground at the beach is perfect for children. Rooms:Blue Bay Curacao Golf and Beach Curacao Resort has four sections offering 120 different accommodations at this luxurious all-suite style resort. The décor varies from unit to unit as many are privately owned. The Hill offers one, two and three-bedroom apartments with full kitchens and private decks that offer views of the golf course and Caribbean Sea. The Village has villas that sport three-bedrooms, two and one-half bathrooms, a full kitchen and patio with views of the gardens, pool or golf course. The Garden features two-bedroom bungalows with a full kitchen, two bathrooms and a patio that overlooks the golf course. The Ocean section has two and three-bedroom apartments with full kitchens, plenty of bathrooms and a spectacular view of the Caribbean Sea from the balcony. Some accommodations are available with private plunge or swimming pools. Restaurants: Blue Bay Curacao Golf and Beach Curacao Resort has AzZuro Restaurant onsite which serves an innovative international ala carte menu for breakfast, lunch and dinner. The Beach Bar has signature cocktails and beach bites throughout the day. Sunset Bar and Grill has delicious grilled items with a Caribbean twist in the evening. Other dining options require a drive to Willemstad or along the coastline. Beach: Blue Bay Beach is one of the nicest beaches on the island with large stretches of white sand that is spotted with palm trees, cabanas and umbrellas. Beach Activities: There are plenty of activities at this beach location including vendors that rent motorized and non-motorized watersport equipment. Impromptu games of volleyball and soccer are played at the beach and there is a playground for children. Swimming at this beach ideal. Entertainment: Blue Bay Curacao Golf and Beach Curacao Resort has tennis courts, a golf course, a dive center and a fitness center onsite. This resort is generally quiet in the evening with no scheduled entertainment for guests. Patrons may take a taxi to Willemstad for nightlife options such as the 27 Bar and Terrace. Kids Activities: This property offers a Kids Club for a small additional fee. The club is located on the beach and features organized games as well as activities throughout the day. There is a large playground for children located on the beach. Attractions: Fitness Center, Dive Center, Blue Bay Golf Course and Tennis Courts onsite; Scuba Diving; Motorized and Non-motorized Watersports; Willemstad; Kura Hulanda Museum; Riffort Village; Queen Juliana Bridge; Christoffel National Park; Ostrich Farm; Hato Cave; Shete Boka National Park; Dolphin Academy; Curacao Sea Aquarium; Floating Market; Maritime Museum. Pools: Blue Bay Curacao Golf and Beach Curacao Resort has a freshwater swimming pool located in the Hill section of apartments. The pool is surrounded by a nice deck and luscious manicured gardens. Some of the accommodations have a private freshwater plunge or swimming pool. The Kura Hulanda Lodge and Beach Club is an upper-middle range Curacao resort that is perfect for the quiet beach going family and scuba divers. The complex is located on the more remote northwestern tip of island and is only one of a handful of properties at Sabana Westpunt. The natural beach is beautiful and there is plenty of space for your lounge chair under an umbrella or palm tree. This low rise property is composed of 10 separate two-story buildings that contain 74 rooms and suites. Junior suites, Pool and Oceanfront one-bedroom accommodations include a kitchenette and extra outdoor living space on the patio or balcony. The beach area here is the star of the property. The seclusion and laid back atmosphere at this beach area is relaxing. Motorized and non-motorized watersport equipment is available for rent through the onsite dive center. The Kalki Beach Bar and Grill will satisfy thirst during the day and the Watamula Restaurant serves a nice selection of international and local cuisine for breakfast, lunch and dinner. The Christoffel Terrance and Lounge is perfect for that romantic libation or unique dining experience. The property has two freshwater swimming pools as well as a fitness center, dive center and tennis courts onsite. There is no scheduled nightlife at his resort and is generally quiet in the evening. The complex has a large playground for children but does not offer a kids club. 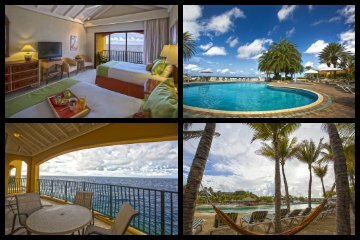 Rooms: Kura Hulanda Lodge & Beach Club Curacao resort consists of 74 rooms and suites that are housed in 10 free standing buildings throughout the resort. Garden view rooms are located on the ground floor with walkout patios. Superior Garden rooms are located on the second floor and have a balcony. The one-bedroom Poolside suites overlook the pool and have a nice balcony or patio. The Oceanfront one-bedroom suite is superb with an ocean view, kitchenette and large balcony. The Oceanfront Terrace junior suites have a kitchenette, view of the ocean and two patios for outdoor space. Restaurants: The resort has a couple of dining options onsite that include the Watamula Restaurant which serves innovative Caribbean and international dishes for breakfast, lunch and dinner. The Christoffel Terrace serves up delectable cuisine from an exciting ala carte menu. Guests can enjoy lunch and libations during the day at the Kalki Beach Bar and Grill as well as themed barbeque buffets on selected nights of the week. The Christoffel Lounge is perfect for light snacks and signature island cocktails. More dining options exist at Jaanchise Restaurant which serves Caribbean seafood dishes and Rancho El Sobrino Restaurant for American and island barbeque cuisine. Beach: The natural beach at Kura Hulanda Lodge & Beach Club Curacao resort is spectacular with a small stretch of white sand which has plenty of space for an umbrellas or you can relax under a palm tree. Beach Activities: The beach activities at this complex include motorized and non-motorized watersports. Equipment is available for rent at the dive center. The Indian Caves are close by for easy grotto exploring and the swimming here is good. Entertainment: The property has a fitness center, tennis court and dive center. The ancient grottos of Indian Caves are nearby and can be explored. There are two bars located on this resort that include the Christoffel Lounge and Kalki Beach Bar. There are themed barbeque nights with live music on selected evenings. Nightlife options are limited at this property. Kids Activities: There is not a formal Kids Club on this property. There is a large playground that is ideal for children. Attractions: Fitness Center, Tennis Courts and Dive Shop onsite; Scuba Diving; Motorized and Non-motorized Watersports; Willemstad; Kura Hulanda Museum; Riffort Village; Queen Juliana Bridge; Christoffel National Park; Ostrich Farm; Hato Cave; Shete Boka National Park; Blue Bay Golf Course; Dolphin Academy; Old Quarry Golf Course; Curacao Sea Aquarium; Floating Market; Maritime Museum. Pools: Kura Hulanda Lodge & Beach Club Curacao resort has two freshwater swimming pools at this location that include one overlooking the Caribbean Sea and the other is a quiet pool situated in a garden area.